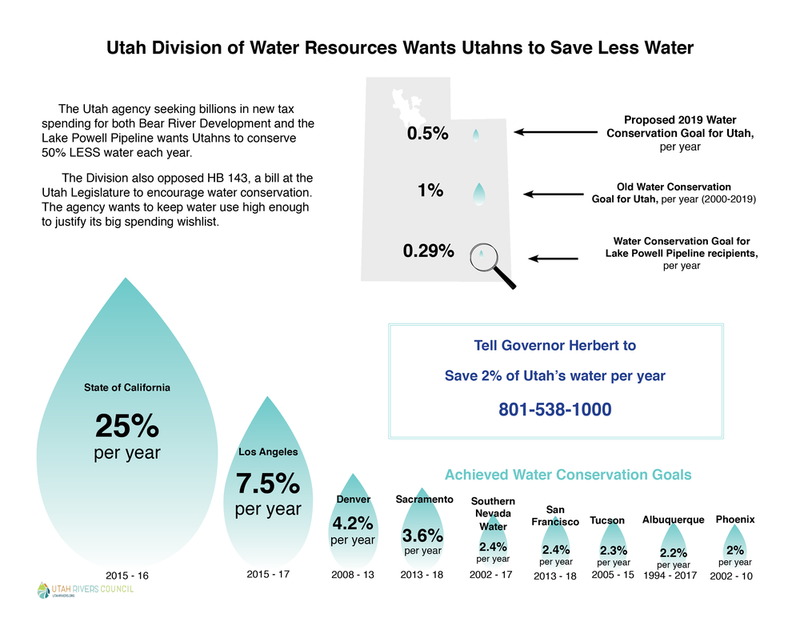 The Utah Division of Water Resources is preparing to release a new water plan which cuts Utah’s current statewide water conservation goals by 50%. The agency is proposing to lower conservation goals from a 1% savings per year to 0.5% savings per year over the next 50 years. The plan hasn’t been shared with the public, but the Division allowed lobbyists working to advance Bear River Development and the Lake Powell Pipeline to consult with them to reduce water conservation efforts. The Division has also been lobbying against new legislation to conserve water, HB 143, which asks cities and other water suppliers to consider what they would have to do to reduce their water use to 175 gallons per capita day (gpcd). In meetings with the Utah Rivers Council, the Division claimed that lowering water use to 175 gpcd was too difficult and shouldn’t be considered further. The Division suggested substitute language for HB 143 which removes any water use targets. Residents of Washington County, Utah use 303 gallons per person per day, more than twice the national average, twice the water use of Los Angeles, Denver and Tucson, and three times the water use of Phoenix. But the Division is proposing to reduce water use in Washington County by only an anemic 0.3% per year between now and the year 2065. Utah’s water use is currently the #1, highest in the U.S. The Division seeks to keep water use high enough to justify the $4-5 billion in new taxpayer spending it seeks to receive for proposed Lake Powell Pipeline and Bear River Development. The Division opposed HB 143 because many of the areas that would receive water from both the Lake Powell Pipeline and Bear River Development have water use much higher than 175 gpcd. If water use is lowered to 175 gpcd or less, these communities will have no need for these water development projects. The national average is 138 gpcd. 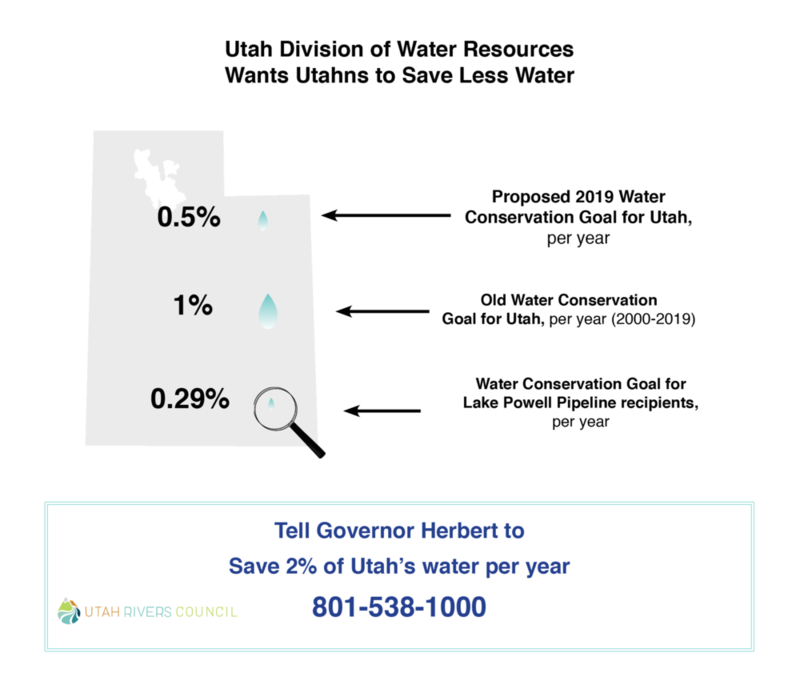 Support water conservation in Utah by submitting a letter to the editor to your local newspaper. LTEs are a great way to spread awareness about an issue. Take a single story from this email or the SLC Tribune story below and tell readers why you believe water conservation is important! A new Salt Lake Tribune story describes the conflict with the Division of Water Resources' new water conservation plan. Read it, and share it far and wide!